"Once mellowed and moldering, the far-flung civilization of the Arabs is being swept today by invigorating winds of change. A fruitful kind of disorder is replacing the old fixed patterns of life." Those contemporary-sounding words were published in 1962, in a glossy, picture-laden, 160-page book titled The Arab World. 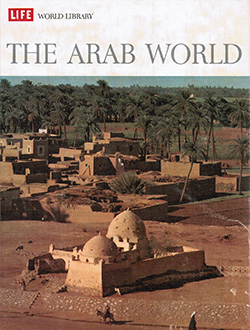 The editors of Life magazine produced "The Arab World." The volume boasts three virtues that make it worth a review a precise half-century later. First, the editors of Life magazine, then the outstanding American weekly, produced it, implying cultural centrality. Second, a retired senior State Department official, George V. Allen, wrote the introduction, pointing to the book's establishment credentials. Third, Desmond Stewart (1924-1981), an acclaimed British journalist, historian, and novelist, wrote the text. The Arab World emphatically represents an artifact from another era; while not entirely sugar-coating his subject matter, Stewart offers a benign, gauzy, patronizing approach that would gag even the most euphemistic writers today. For example, he suggests that a Western visitor to the Arabic-speaking countries enters "the realm of Aladdin and Ali Baba. The people remind him of his illustrated Bible." One encounters little of this sentimentality in the age of Al-Qaeda. More interestingly, the book demonstrates how easily a prominent analyst can misread the big picture. As suggested by its title, one theme concerns the existence of a single Arab people from Morocco to Iraq, a people so tradition bound that Stewart resorts to an animal analogy: "the Arabs possess a distinctive common culture which they can no more throw off than a hummingbird can change its nesting habits to those of a thrush." Ignoring the Arabs' failed record to unify their countries, Stewart predicted that "whatever happens, the forces for [Arab] union will remain." Hardly: that urge died not long after 1962 and has long remained defunct, as has its shallow premise that the Arabic language alone defines a people, ignoring history and geography. His second theme concerns Islam. Stewart writes that this "simple" faith has raised humanity "to a new height" and that it is "not pacifist, but its key word was salaam, or peace." He calls Islam a "tolerant faith" and describes the Arabs historically as "tolerant conquerors" and "tolerant overlords." Muslims dealt with Jews and Christians in a "tolerant" way. Indeed, "The Arabs' tolerance extended to culture." All this tolerance prompts Stewart blithely but unwisely to dismiss manifestations of Islamism, which he says "have an old-fashioned air to them and have little appeal for the young." In brief, Stewart is clueless about Islamic supremacism from its origins to modern times. 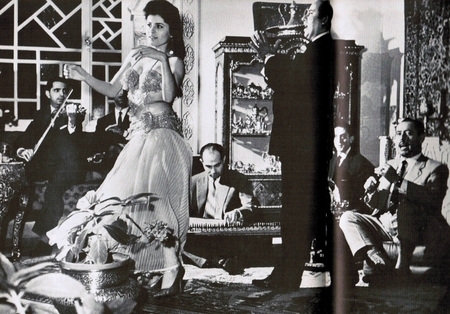 The book caption: "At a Levantine-style party given by a millionaire Arab businessman, a Lebanese dancer by the name of Kawakib performs the traditional belly dance. As Kawakib danced, the guests danced and sang." A third theme involves Arab determination to modernize: "One of the surprises of the 20th Century has been the way the Arab Moslems have accepted change and the modern world." Excepting Saudi Arabia and Yemen, he finds everywhere that "Arab modernism is a tangible, visible, audible force." (Thus the "invigorating winds of change" in my first sentence.) His myopia concerning females makes for stunning reading: "The harem and its psychological pillars have been dynamited by the 20th Century." "In economic affairs, … women are almost men's equals." He sees what he wants to, undisturbed by reality. 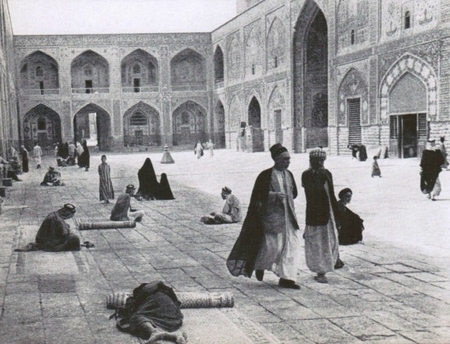 The book caption: "Friendly scholars of the Moslem Shiite sect stroll in a courtyard of their shrine in Najaf, Iraq, while others pray, meditate or even sleep." Continuing this theme of wild-eyed optimism, Stewart discerns Arabic-speakers breaking free of an ancient mold, determined "to destroy the old stereotypes." He writes about the seventh century as no one today would dare do, especially not after the failure of George W. Bush's Iraqi ambitions and Barack Obama's Libyan escapade: "The first four caliphs had been as democratic as Britain's William Gladstone, if not America's Thomas Jefferson." Stewart even claims that "Arab civilization is part of western, not eastern, culture," whatever that might mean. 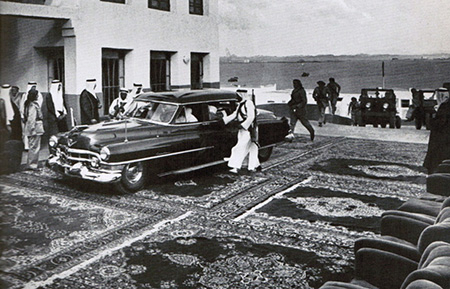 The book caption: "Traversing a welcome mat of rich Persian rugs, Saudi Arabia's King Saud arrives in a Cadillac on the terrace of a royal palace." The mistakes of one's predecessors has a humbling effect. An analyst like me hopes not to be so obtuse as Desmond Stewart and Life, and not to be shown up so badly with the passage of time. Indeed, I study history with the hope of gaining a larger vision and thereby not being limited by current assumptions. In 2062, tell me how I am doing. Mar. 6, 2012 update: I explain the choice of this topic at "Why I Am Not Writing About Iran." Apr. 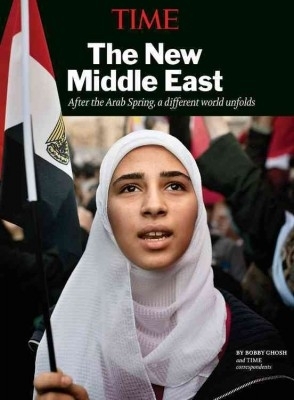 17, 2012 update: Time has today published out an 112-page book on roughly the same subject, edited by Bobby Ghosh and titled The New Middle East: After the Arab Spring, a Different World Unfolds. The Middle East is suddenly a world transformed. In just one year since the Arab Spring was sparked, millions of citizens from Tunisia to Yemen have taken to the streets in revolution against the old regimes. Tyrants have been overthrown, repression is faltering, and a new generation has asserted itself in the Islamic world. From the editors of TIME comes The New Middle East, a fascinating book chronicling revolution and its impact on the world with eyewitness reporting, exclusive pictures and insightful analysis. In the midst of this upheaval, so much is new and changing: the rights of women, social media, national identity, the role of Islam in politics. Will the people get the economic and social opportunity they yearn for? What new benefits-and dangers-present themselves for the United States? TIME Middle East experts Bobby Ghosh, Aryn Baker, Karl Vick and other contributors paint a vivid portrait of a society in the throes of historic change. At least, though, the editors now use the term Middle East rather than Arab world. Related Topics: History, Middle East patterns | Daniel Pipes receive the latest by email: subscribe to the free mef mailing list This text may be reposted or forwarded so long as it is presented as an integral whole with complete and accurate information provided about its author, date, place of publication, and original URL.